Heat oven to 350°F. Spray 2 (10-oz) custard cups or ramekins with cooking spray. Place biscuits on microwavable plate. Microwave on Medium (50%) 30 to 45 seconds, turning over halfway through microwave time. (Biscuits should still be cold for easier handling.) Cut each biscuit into 8 pieces. Place 8 pieces in each custard cup. In small bowl, beat cream cheese, 1 tablespoon sugar and egg yolk until smooth. Beat in milk and vanilla; stir in apple. Pour mixture over biscuit pieces in custard cups; stir gently to mix well. In small bowl, mix 1 teaspoon sugar and the cinnamon; sprinkle over custard mixture. Bake 23 to 25 minutes or until custard is set and tops are light golden brown. Cool 5 minutes before serving. 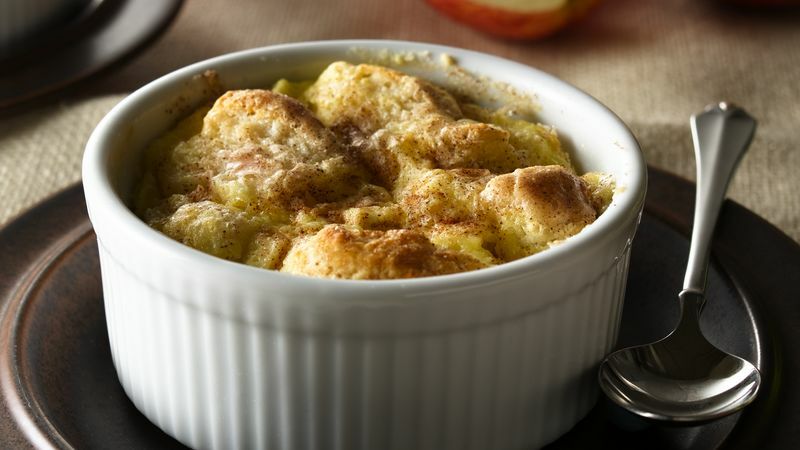 Granny Smith or McIntosh apples are a good choice for this luscious recipe.